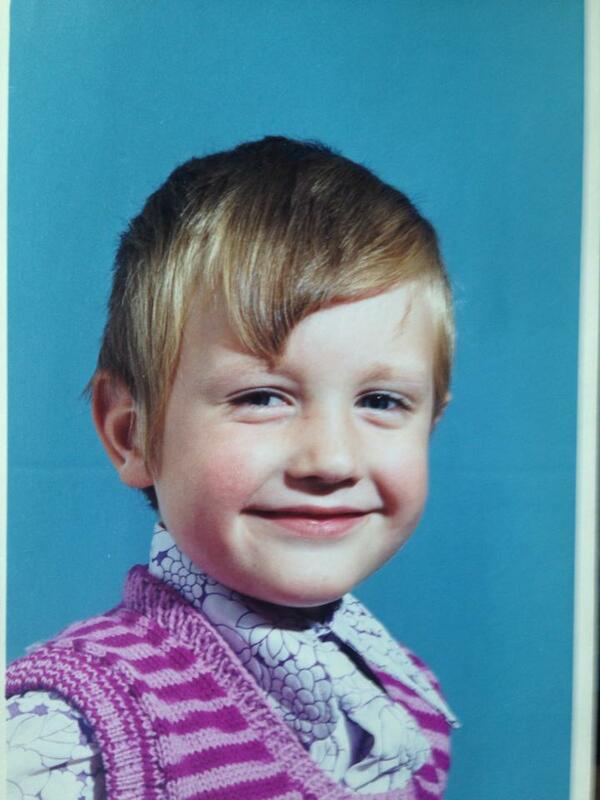 Facebook recently had people posting childhood pics of themselves and I thought I’d dig out one of mine, so here’s the post I did based on a photo from my childhood which I’ve amended and re done as my latest blog. 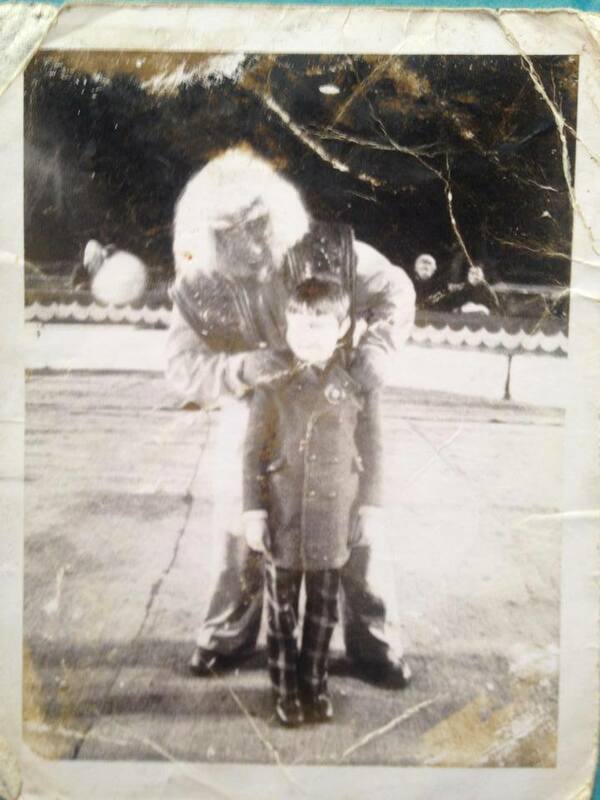 The photograph features myself meeting Dr Zaius circa 1974/5 making me six or seven. 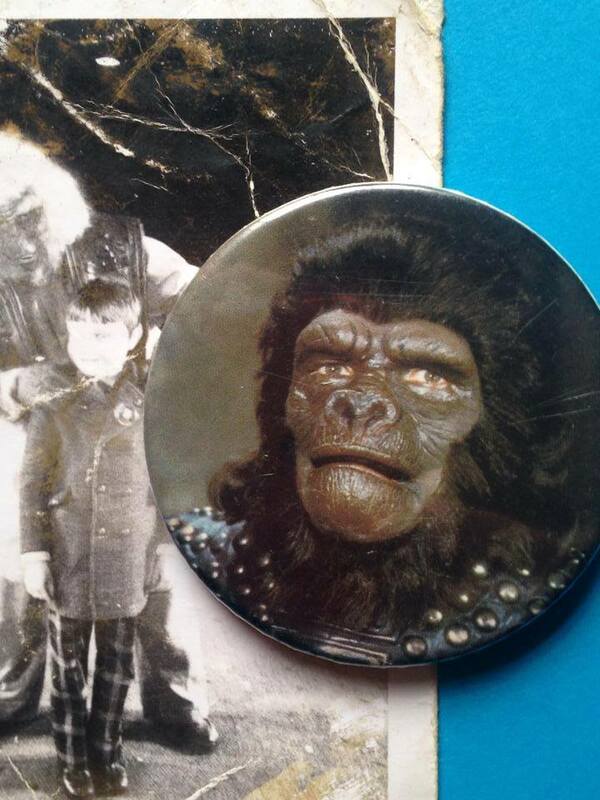 This was taken at the live UK ‘Planet Of The Apes’ touring show that ran during ’74 and ’75 and inspired by the popularity of the 1974 US TV show ‘Planet Of The Apes’ which itself was a small screen spin off of the ‘Planet Of The Apes’ films. 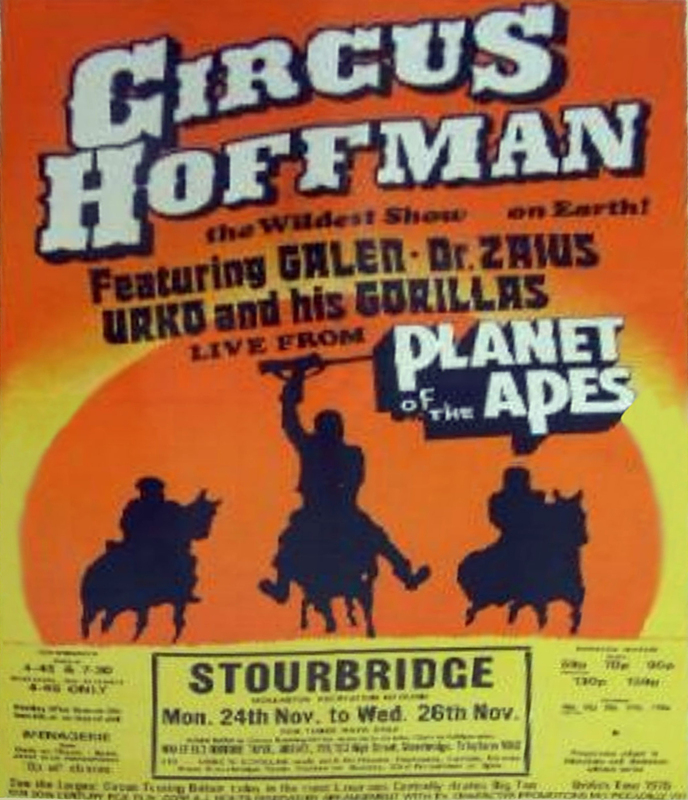 I remember the show well, my parents got us tickets to see it in a circus venue in the Midlands which I originally thought might have been Wolverhampton but after some research I now think it could have been from this performance in Stourbridge, my folks can’t recall exactly after all these years. A real treat for me because I loved the films and the TV series. Lookin’ the biz wearing a snazzy Damien Thorn like ensemble, a year or two before the infant Anti-Christ entered the public consciousness (although I’m sure my younger cousin Heidi will claim that I was the Devils child already at this point), the trousers were black and yellow checks and a green coat (cheers Mum and Nan, you knew the score, even then, still love my snazz) probably my best ‘goin’ to gigs’ getup back in the day. I was beside myself with the thrills, stunts, gun fights and battles of the live action show. 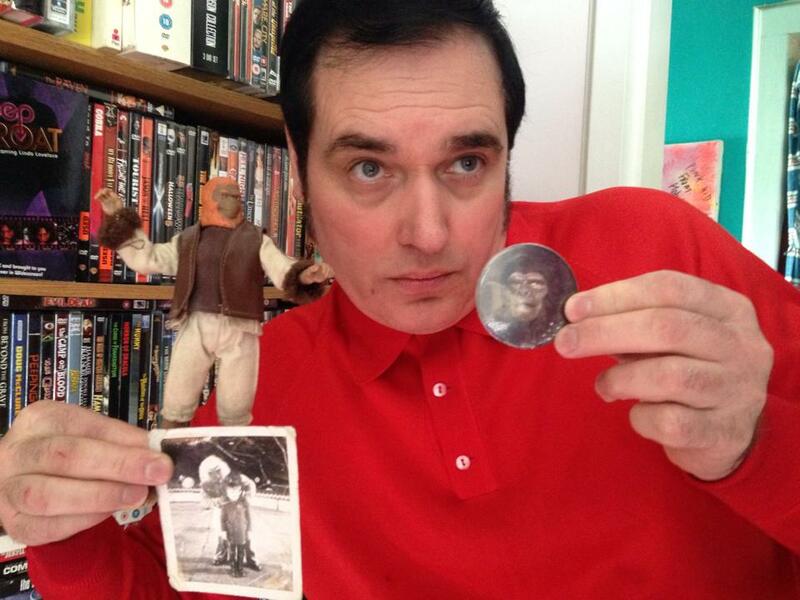 I still have the pin badge from the performance featuring General Urko from the TV series, you can see it on my lapel. 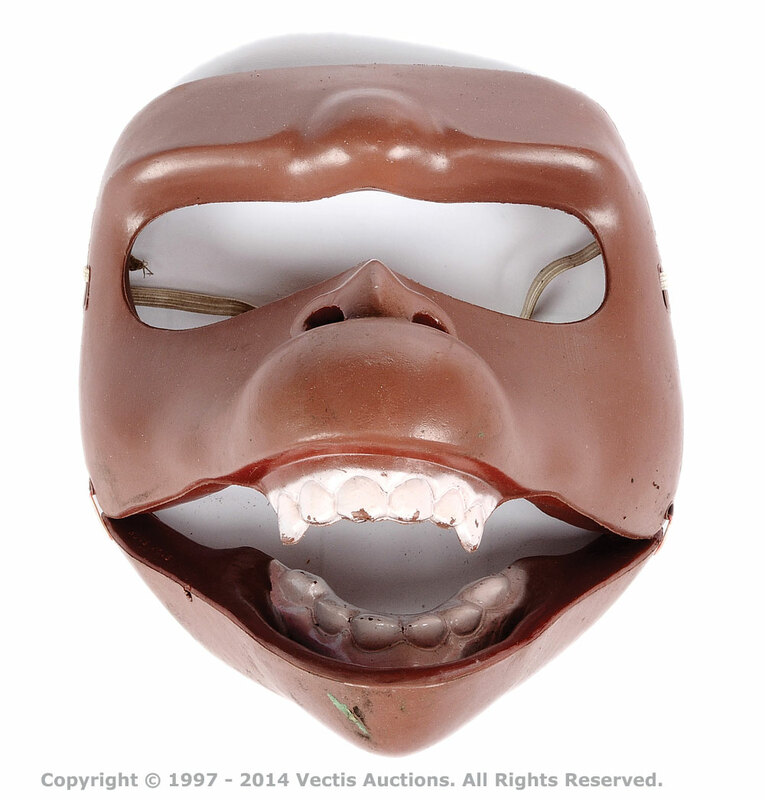 and a programme and plastic ape mask with a hinged jaw that moves the mouth when one talks, it’s packed away someplace in my attic but it’s the same as this one pictured here. 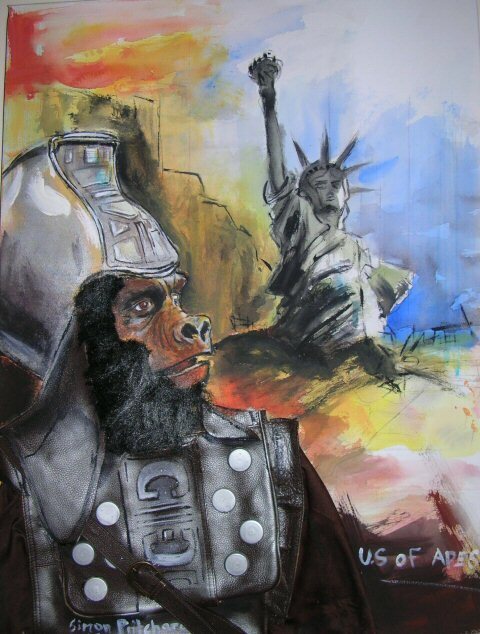 Ironically one of my Planet of the Apes paintings sold to a fellow Apes fan shortly after I wrote the first draft of this post for facebook. 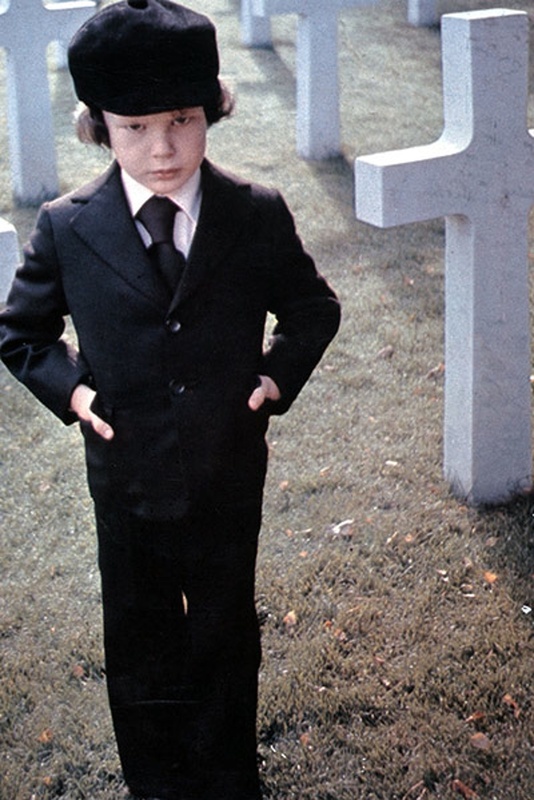 …wonderful times, I loved my childhood, I loved my dog and I still love ‘Planet Of The Apes’, .. oh yeah and ‘The Omen’ too. Till next time…Happy Days folks.